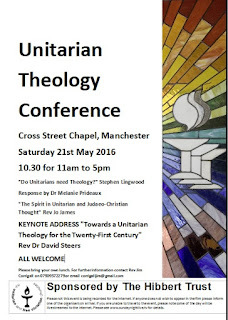 Something I've been working on. .
All are welcome at a Unitarian Theology Conference at Cross St Chapel, Manchester, on Saturday 21st May, 2016, 10.30 for 11 am start. Details are on poster below. Fuller details also in text below. Lunch (please bring your own, or sandwich bars nearby). Century" Rev Dr David Steers. Panel Discussion: Revs Sarah Tinker, Sheena Gabriel and Lewis Connolly. Opening and closing devotions, as well as time for Q + A. 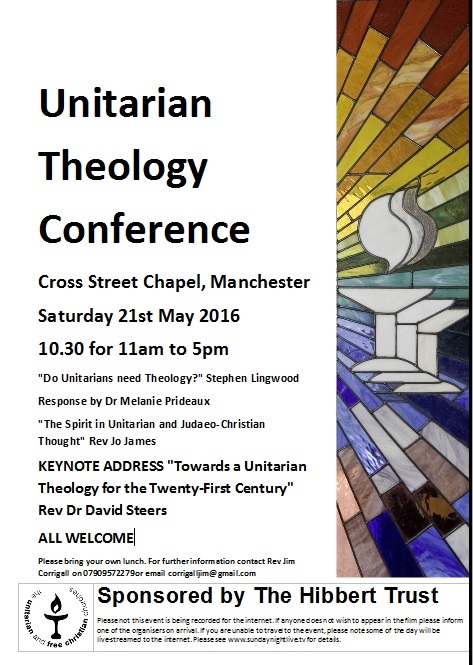 The conference is supported by The Hibbert Trust. Further information contact Rev Jim Corrigall.